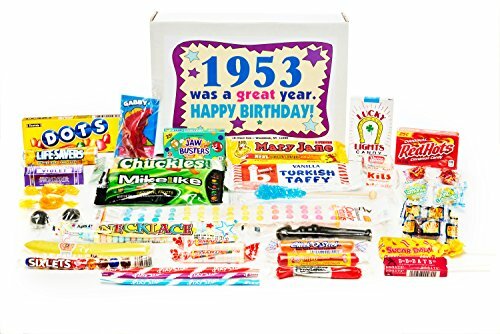 Woodstock Candy 1953 65th Birthday Gift Box - Nostalgic Retro Candy Mix from Childhood for 65 Year Old Man or Woman Jr.
An absolute delight for the 65-year-old with a sweet tooth! For friends or family members born in 1953, this birthday candy gift box contains a huge variety of classic candies. Even the most hard-to-shop-for giftee will love opening this festive box of sweet treats that are sure to inspire nostalgic memories-and more than a little indulgence. Candies are selected specifically for your recipient's age, drawing from the most popular and prized varieties from their childhood. Share stories and memories with your loved ones as they unwrap such candies as Turkish Taffy, Dots, Red Hots, and more. Anyone born in 1953 will love enjoying a trip down memory lane as they unbox these hard-to-find sweets such as Atomic Fireballs, Kits, Jawbreakers, Mary Janes, Candy Buttons on Paper, Candy Cigarettes, Candy Necklace, Chick-O-Stick, Licorice Balls, BB Bat, Jawbreakers, Chuckles, Coconut Long Boy, Dots, Bubble Gum Cigar, Bonomo Turkish Taffy, Lemonheads, Lifesavers, Butterscotch Buttons, Classic Caramel, Licorice Pipe, Necco Wafers, Pixy Stix, Red Hots, Root Beer Barrels, Rock Candy, Sixlets, Smarties, Sugar Daddy Jr., Violets, and Wax Lips. Please note, on occasion we might have to substitute an out-of-stock item with candy of the same value. This candy assortment arrives ready for gifting in a bright and colorful box, packed to the brim with your gift recipient's favorite candies. Treat your husband or wife to the sugary sweets of their youth, reminding them of all the wonderful memories you've shared. No 65-year-old will be able to resist trying some of the snacks they used to enjoy. Give the gift of a real "taste of the past" with this eclectic collection of sweets.